M 1/c J. Edwin Payne, son of Mrs. Etta Payne, graduated from Chattanooga High School, Okla. , A & M and Univ. of Okla. 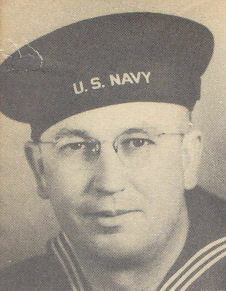 Entered Navy in 1943, trained in Farragut, Idaho, Mare Island, Vallejo, Cal. ; served in Panama, New Zealand, Australia, New Guinea, Luzon and Samar; was discharged in Nov., 1945. Awarded Pres. Unit Citation, Am. Theatre Ribbon, Asiatic Pacific Ribbon, Philippine Lib. Ribbon.